For the 13 years Charlie Weiss lived in his home in Winterville, North Carolina, he never paid any attention to his neighbors beyond a casual “hello” every now and then. A year ago when a new woman and her dog moved in next door, Weiss assumed he would continue to keep to himself. Then, one day, Weiss was out on his porch, and he got the feeling that someone was watching him. 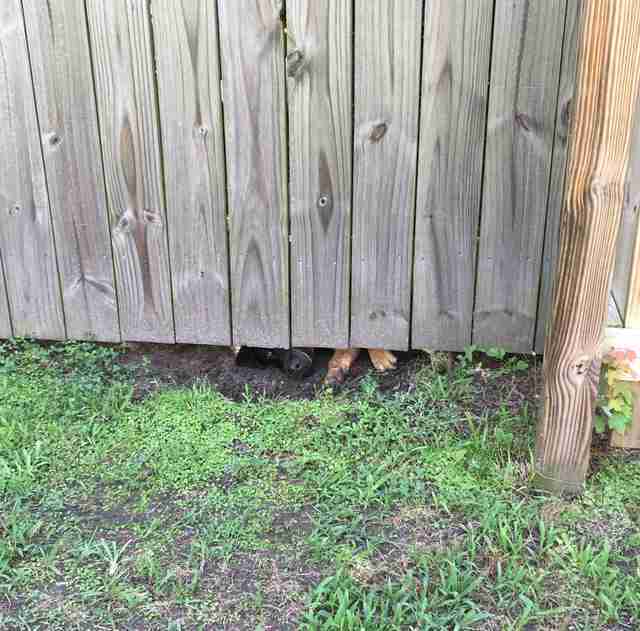 He scanned the yard, but everything seemed normal. Then he looked down, and spotted a furry spy. 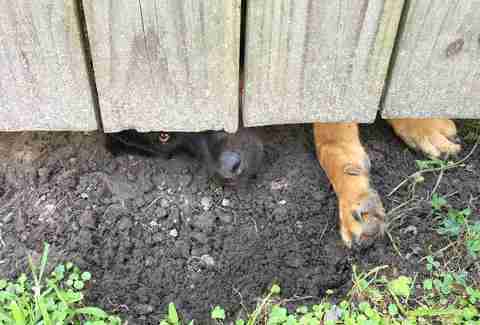 His new neighbor’s German shepherd mix had found a small gap between the dirt and the fence, and decided to make good use of it. While Weiss rarely ran into his new human neighbor, her dog became a frequent presence. 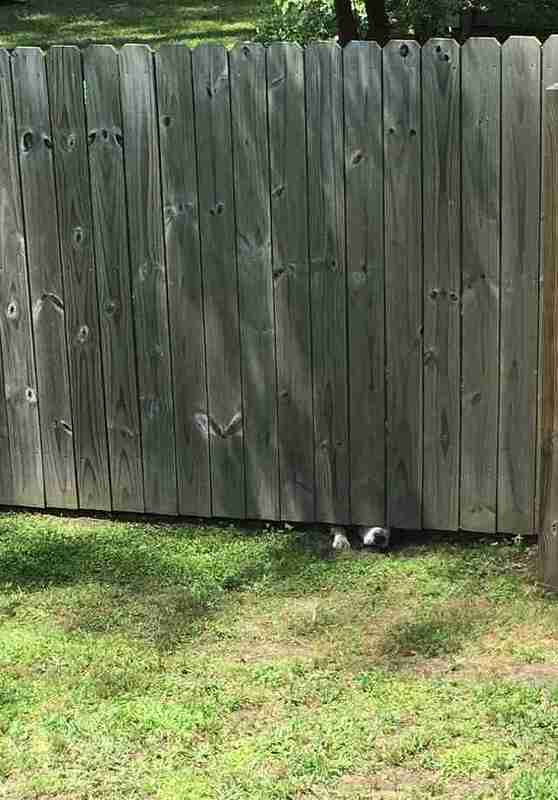 Soon, every time Weiss would step outside, he’d be met by a curious snout sticking out from under the fence. Just as Weiss was getting used to the ever-present snooping, he was met with another surprise when his neighbor adopted a second dog. 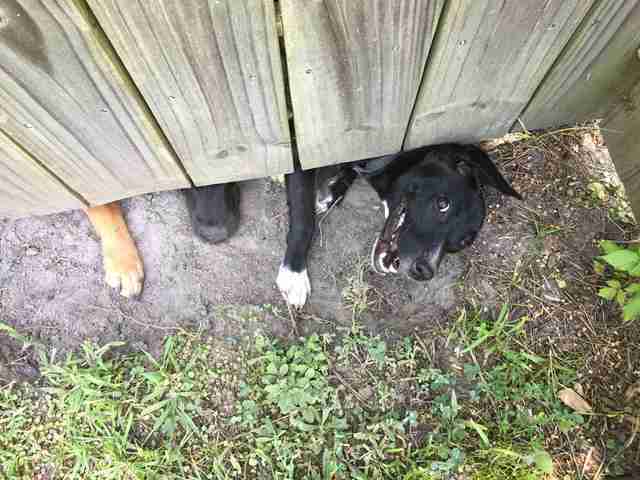 But the pit bull mix needed a little time to get used to having neighbors. As time went on, both dogs became very nosy neighbors, eager to see Weiss every time they heard his front door open. Then one day Weiss stepped outside and instead of a familiar snout, he was greeted by the big brown eyes of a third dog — a smiling black and white puppy. 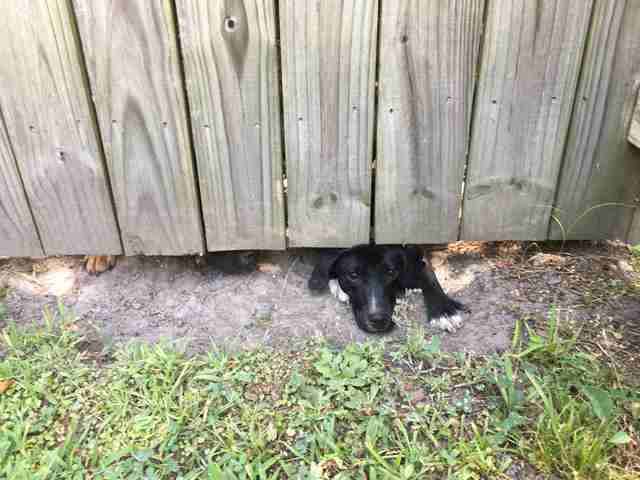 The puppy had expanded the hole made by his dog siblings with one goal in mind — to break into Weiss’ yard. As small as the puppy was, he still couldn’t quite fit, but his struggle made for an excellent photo op. "I joke with a friend that one day I'm gonna show my neighbor those pictures and tell her, 'Look, you had a good run, but they've made their decision. They're mine now,'" Weiss said.